The first edition of this revolutionary look at the scientific discoveries that changed our perception of the world, by the renowned physicist and bestselling author Stephen Hawking, sold over 65,000 copies. Now it's available in a gift-worthy special edition with color photographs and illustrations depicting theoretical models of the planets and their orbits--making Hawking's brilliant insights all the more accessible. This original compilation is based on seven classic works of physics and astronomy which, read in chronological order, trace the evolution of modern science. 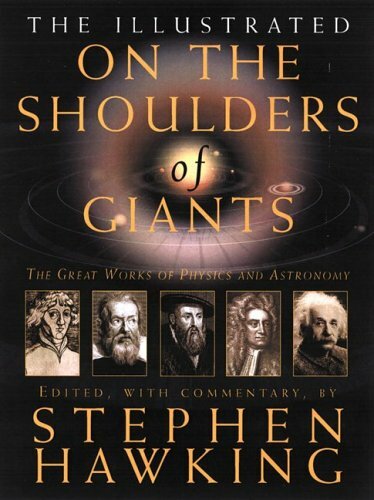 THE ILLUSTRATED ON THE SHOULDERS OF GIANTS includes selections from On the Revolution of Heavenly Spheres by Nicolaus Copernicus; Principia by Sir Isaac Newton; The Principle of Relativity by Albert Einstein; Dialogues Concerning Two Sciences by Galileo Galilei with Alfonso De Salvio; plus Harmony of the World by Johannes Kepler. It also includes five important critical essays and an original biography of each physicist, written by Hawking himself. Stephen Hawking's ability to make science understandable and compelling to a lay audience was established with the publication of his first book, A Brief History of Time, which has sold nearly 10 million copies in 40 languages. Hawking has authored or participated in the creation of numerous other popular science books, including On the Shoulders of Giants and The Illustrated On the Shoulders of Giants.